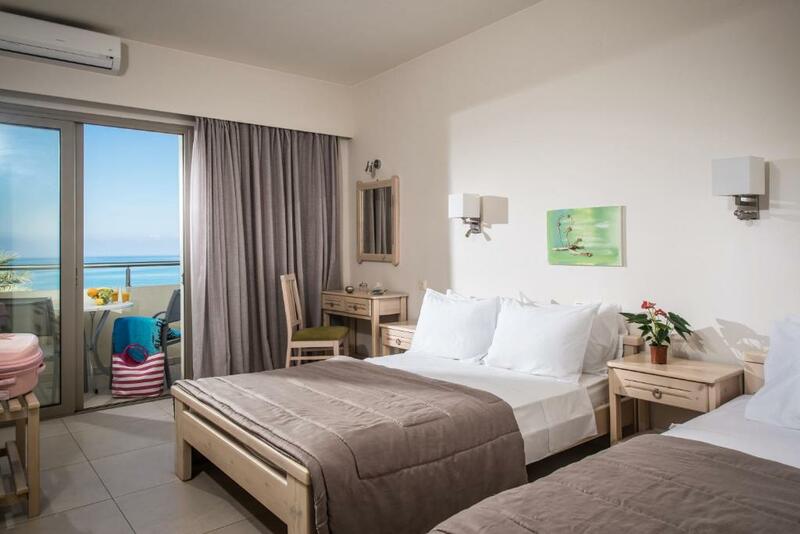 Lock in a great price for Malliotakis Beach Hotel – rated 8.9 by recent guests! Family run friendly people helping with everything beyond and above. Firstly, it is family hotel. So reception and hospitality were perfect. Very nice and kindly people. Great and convenient location, evything what you need you can reach by few steps. Good and tasty breakfast. Fully recommend! Lovely modern rooms in a great part of the town. Fab location great staff. Lovely pool and direct access to beach excellent massage man on site too. Very clean and would recommend and will return. Very nice new hotel. Friendly staff, good location. The hotel has an excellent location surrounded by many beautiful bars and restaurants. It is locates in a very live district. You can have very pleasant walk every evening and try the local food and drink (highly recommended). Rooms very modern and bed very comfy. Large pool and access straight on to the beach. Wonderful seating areas with hammock chairs. Good food. Yiannis at the bar and all staff were welcoming and friendly. Right on the strip so seconds walk to bars and restaurants. The place is very nice and clean, the pool is very nice too. Heel erg vriendelijk personeel, echt een familiebedrijf. Parkeren kan recht naast het hotel. Het ontbijt wordt geserveerd op het terras (geen buffet). Het aanbod was goed en voor ons voldoende. Het zwembad was prima, erg fijn dat je zo het strand op liep waar bedjes staan (tegen betaling). De kamer was erg netjes en werd dagelijks schoongemaakt, de handdoeken werden om de dag vervangen. Wij hadden een zeezicht kamer, dit is een aanrader. Je zit vlakbij vele restaurants en winkeltjes. Pal tegenover het hotel zit een supermarkt. Malliotakis Beach Hotel This rating is a reflection of how the property compares to the industry standard when it comes to price, facilities and services available. It's based on a self-evaluation by the property. Use this rating to help choose your stay! All rooms of Malliotakis are equipped with a fridge and a flat-screen TV. 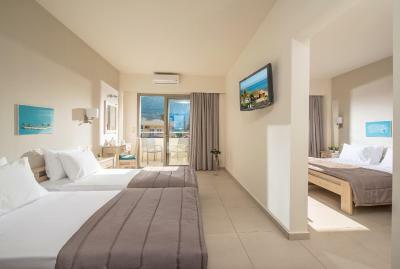 Each comes with a private bathroom with shower or bath tub and a hairdryer, while some units offer views over the Cretan Sea or the surrounding area. Guests can relax at the sun loungers by the pool and enjoy a refreshing drink from the on-site snack bar, while younger guests can spend their time at the children's pool. Billiards are also available on site. A variety of restaurants and shops can be found within a short walk from the property. Hersonissos is 3.1 mi from Malliotakis Beach Hotel, while Agios Nikolaos is 17 mi away. Nikos Kazantzakis Airport is 15 mi from the property. Free on-site parking is possible. 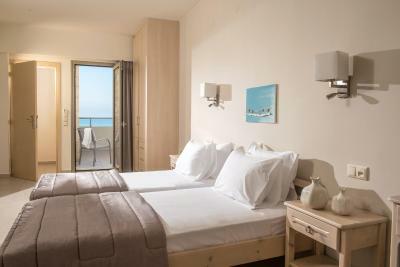 When would you like to stay at Malliotakis Beach Hotel? Spacious room with a balcony or patio, fridge, flat-screen TV and free WiFi. 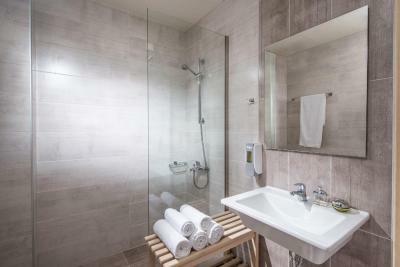 It includes a private bathroom with shower or bath tub and a hairdryer. Some units offer views over the Cretan Sea or the surrounding area. Room with a balcony or patio, fridge, flat-screen TV and free WiFi. It includes a private bathroom with shower or bath tub and a hairdryer. 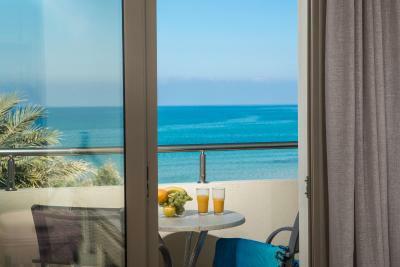 Some units offer views over the Cretan Sea or the surrounding area. Room with a balcony or patio, fridge, flat-screen TV and free WiFi. It includes a private bathroom with shower and a hairdryer. Some units offer views over the Cretan Sea or the surrounding area. 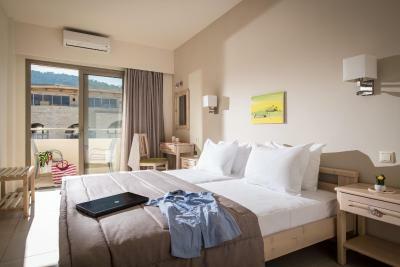 This double room features a soundproofing, air conditioning and sea view. This triple room features a tile/marble floor, sea view and soundproofing. House Rules Malliotakis Beach Hotel takes special requests – add in the next step! Malliotakis Beach Hotel accepts these cards and reserves the right to temporarily hold an amount prior to arrival. Breakfast is continental and we went out for breakfast for variety. Not adults only hotel. Noise of the Cars/coaches dropping off to the front of the hotel when in bedroom. The pool is small. The breakfast is too simple. It is served for you so you do not have option to take what you want. The sea-side beds are not free (9 euros/2pers.). The staff wasn't understanding and warm.... Every thing cost extra money even though we paid a lot. ( the air con, the safe and even the sun beds next to the sea). When we asked the staff for ideas what to do in the area they told us to go to a travel agency that cost us a lot of money and didnt helpd us a lot. Nothing except you can't take full advantage of the power shower because it's too powerful and floods the bathroom.